Have you ever thought about giving a new look to your living room? Whether it is about replacing a furniture piece or changing the entire layout, the right technique can absolutely set your mood. You will thank yourself when you come back home after work. Everybody wants their living room similar to the ones in the home decor magazines and blogs. These are mostly the homes of interior decorators. Without any doubt, the decorators exactly know how to make a difference with their ideas and creativity. That is why they never fail to impress anyone with the beautiful home decor ideas. The best part about their style is they do not believe in doing too much or spending too much on the decor. They believe in the concept of minimalism which makes it affordable. Many times, the little changes hugely affect the decor. 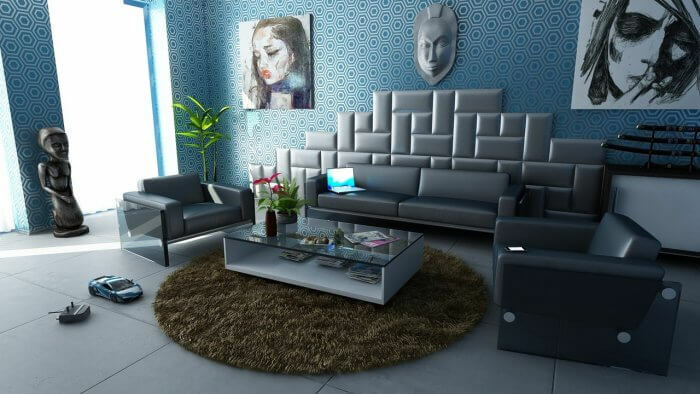 Here are some small tips that can make your living room much more elegant than before. These are not only affordable but also simple to do. Let’s have a look at them. The living room furniture pieces are very costly. It is not every day that you buy a new sofa or armchairs. It needs proper planning before you make up your mind. If you have a small space, you can go for multifunctional furniture. These furniture items have extraordinary features like you can quickly convert a sleeper sofa into a bed. So, if you want to host a slumber party with your friends then do not worry. These sleeper sofas will be of great help by providing enough sleeping space for them. Many people feel that it is difficult to decorate a small space the way they want. If you are also dealing with the same issue, there are a number of ways that can help you. Prefer a light color for your walls. Decorate it with mirrors to make the room look big. Do not use the dark colors as they give a compact touch to the room. Also, mirrors reflect the natural light entering through the windows in the room. It makes your room appear larger than it is. There are many storage options for your living room in the market. Instead of buying lots of smaller pieces for storage, buy a single one that has enough space. Also, such furniture pieces are affordable. You can place your everyday essentials like tv, CDs, books, etc in a single place. Modular furniture provides you enough storage for such purposes. When you have a tight budget and want to save as much money as you can, look out for the pieces that you already have. It is the cost-effective way to use the old pieces. This way, you will also stay close to the beautiful memories. For instance, decorate the wall with the old family photographs. It will cheer you up when you are feeling low along with improving the decor of your living room. Have Your Tried Rugs On The Living Room Floor? People have started adding rugs to their living room decor. This piece not only provides warmth to space but give elegance to the interior. If you are struggling with the ugly looking floors, place a few rugs of beautiful colors and patterns in the room. They are also easy to clean. That is why you cannot think of a better option to enhance the look of the floors other than the rugs. If you want to buy a pretty rug or furniture piece like a sleeper bed, coffee table, etc, there are many furniture stores online. You have to browse the furniture store websites to find the perfect one for your home. Whatever you do with the decor, make sure you keep it as simple as possible. This technique will make the room airier and also organized. It will also be easy for you to clean the space without any difficulty. Keep the above-mentioned tips in mind to give a makeover to your living room. Happy decorating!